Very exciting! I really miss fostering. 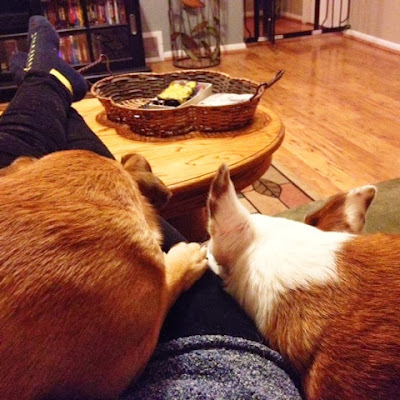 We fostered six dogs before we adopted Eden, and I would really love to do it again. But maybe not until we can get our girls to chill out a bit more! Isn't it wonderful/amazing how much the presence of another dog (even a grumpy dog!) can calm your anxious dog? 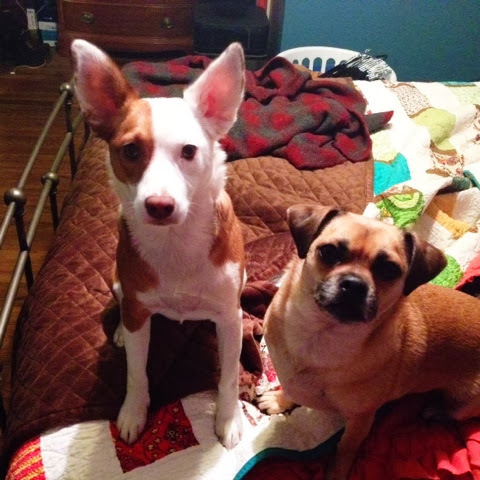 Pyrrha thrives in the presence of another dog, and fostering was such a great way to discover that and to learn what personality of dog she most enjoyed. I'm looking forward to reading more about Sampson and your adventures in fostering! I've had two fosters previously, which made three dogs total at the time and no risk of "foster failure," especially when I was on my own. I find it so very rewarding and it's an opportunity to meet and get to know more wonderful dogs in our lifetimes. I have fostered a few dogs. It's hard work! I always felt like it was my job to ready them for their new home - which often means lots of training. I was especially micromanaged by one of the rescues I fostered for so that added even more pressure to the responsibility. I think if you find a great rescue group to work with then it is well worth the effort. By great I mean a group that will be there if you have questions or concerns, that won't make you feel like dirt if the dog isn't a good fit for your home, that encourages positive reinforcement training and won't hem and haw about giving you permission to take the dog to a vet if there is a health issue that needs to be addressed. Some rescues only like to vet their dogs if there is surgery required because then they can use that as a fund raiser on their page. For something like diarrhea, ear infection, other "small", easily treatable symptoms - some rescues like to play vet and address the issues with left over antibiotics, etc. I don't want to deter anyone from fostering - but it is good to go into it with eyes wide open. Some will even say they will provide food and then act like you are really putting them out if you ask for more food or else give you expired dog food. I guess the way I view foster dogs is they are not second class citizens and should receive the same level of care/food/training/love that I would give my own dog. I feel very good about the communication I've had with this rescue group, and it's one of the reasons I chose to go with the American Eskimo breed. I had some contact with another rescue whose cause I felt strongly about and was very disappointed with their response time and lack of organization - I could tell early on that fostering through them would be a mess. I feel there will be a great deal of support with Sampson's rescue, and their contract and policies are very well laid out. I've had two fosters previously - one through a small one-woman rescue and one informal that I was able to have "sponsored" through a prior work colleague who was on the board of rescue group. I'm expected to provide the food and so Sampson or any other foster will be eating what Ruby eats. Thank you for sharing your experience! It is a big commitment for sure. Well as you already know, we foster and we love it! Yes its a lot of work, but the rewards are well worth it. The group that we foster for are awesome. I actually finally met the organizers on Saturday. They are a young group of woman and they genuinely care for these dogs and appreciate the foster families. I did try to foster for a few local rescues but they never responded (which blows my mind!). Stella does act a little bratty and entitled with some dogs but this last BC mix was a great companion for her. The rescue we work with also knows exactly how Stella plays, so they match us with dogs that have energy like Stella. There are lots of Pros, but the Con is managing both dogs while we are at work. Stella is great loose in the house, but Ive only found one dog that we could leave her loose with. Im too worried about the "what if". Plus I cant have a dog that barks outside. The last foster had severe... I mean severe seperation anxiety. Each dog is different. My one suggestion is to look into DropCams. That has saved me some worry with the fosters! I work a short distance from home, so if there are issues I can see it on the camera and I can run home. We foster to save lives, but also to give Stella a playmate. It does wear her out! The home alone thing is my biggest concern, as well. I don't want the foster to be crated all day, but I won't leave it alone on Ruby's side unless I feel very confident about their interactions. The living room side houses Nina's cat box, so I'd need to be sure the foster doesn't chase her in order to leave it un-crated. Sampson sounds very gentle and I'm hoping that they will be fast pals. I think fostering is in our future, but perhaps when we don't own three dogs... Fostering older dogs is especially appealing to me. It went so much better than I'd hoped with those two! I had my foster chihuahua along with Freya and Lasya right after getting divorced and it was...a lot. It will go a long way in helping me not to "foster fail" remembering three dogs are too many, so if I want to help a number of dogs I will have to let each one go on to its own forever home! Older and senior dogs especially deserve a soft place to land when they find themselves displaced. What great news that Cosmo and Ruby got along so well! Sometimes all it takes is an adjustment period I guess. I'm so glad your looking into fostering Sampson, I saw you post his photo on Pinterest and my heart strings got tugged. I love Eskie's and he looks like the sweetest guy. I'm not sure it will translate so smoothly at Cosmo's house, but it's definitely progress! It helps that Ruby has been learning some self-control. I'm excited to start our fostering adventure!